The state House approved a $12.1 billion state budget Wednesday for the next fiscal year, meeting a legislative deadline to pass a budget bill on to the Senate. Associated Press. Gov. Neil Abercrombie rallied reporters to the Capitol Wednesday so he could send a message to the public that the state Council on Revenues’ significantly downgraded economic forecast is no cause for alarm. The council on Tuesday lowered its January projection of 3.3 percent growth in general fund revenues down to zero for 2014. The council also dropped its forecasts for 2015 and 2016 to 5.5 percent and 5 percent, respectively. This means the state government will have almost $1 billion less to spend over the next two years than it expected, completely recasting the budget debate. Civil Beat. The Legislature passed the executive budget today, setting in motion deliberations throughout the Capitol on funding for the remainder of this year and next. This on the heels of the Council on Revenues downward projection of economic growth. Hawaii Public Radio. In advance of legislative "crossover" last week, the House and Senate collectively passed more than two-dozen bills creating or amending tax credits to benefit various industries. In the wake of the Council on Revenues prediction on Tuesday that the state is expected to receive $180 million less revenue this year than initially anticipated, it's unlikely that many of the tax credits will become a reality in 2014. But House Finance Committee Chairwoman Sylvia Luke said that despite the lowered economic forecast, the proposals are still up for discussion. Civil Beat. The Hawaii State Bar Association rated Circuit Judge Michael Wilson "unqualified" for the state Supreme Court because of concerns about his work ethic, professionalism, the propriety of his conduct toward professional women, and his ability to serve at the level of the state's highest court. Gregory Markham, the president-elect of the bar association, explained the reasons in a letter on Wednesday to the state Senate Judiciary and Labor Committee. Star-Advertiser. The Hawaii State Bar Association on Wednesday submitted additional testimony on Judge Michael Wilson's nomination to the Hawaii Supreme Court that raises more specific questions about whether he is qualified and suitable to be an associate justice. Civil Beat obtained a two-page letter, sent from the bar association's President-elect Greg Markham to state Sen. Clayton Hee, chairman of the Senate Judiciary and Labor committee, which just last week voted unanimously to send Wilson's nomination to the full Senate for a final vote. The Hawaii State Bar Association said Wednesday that it rated Circuit Judge Michael Wilson — Gov. Neil Abercrobmie’s nominee to an associate justice post on the Hawaii Supreme Court — as “unqualified,” based on negative comments from a number of bar members who cited "work ethic concerns, a lack of professionalism in the workplace and questions concerning the propriety of conduct toward women in professional contexts, and the ability to serve at the level of a Supreme Court justice." Pacific Business News. David Chang, the chairman of the Hawaii Republican Party, will step down to concentrate on military and business commitments, sources say. Former congresswoman Patricia Saiki is expected to be named the new party chairwoman. Star-Advertiser. Hawaii’s minimum wage is $7.25 an hour, but according a report by a public policy research organization, Hawaii’s welfare wage is more than four times that amount. The study, conducted by the Cato Institute, claims that in 2013, a mother with two children in Hawaii received an average of $60,590, or $29.13 an hour. But is that number accurate and is it fair to taxpayers? KHON2. The Hawaii Department of Education recently announced the launch of a bold plan to significantly cut down on energy costs by outfitting schools with alternative energy technologies including solar and wind. But the “Ka Hei” initiative, as it’s being called, hinges largely on schools’ ability to connect proposed solar systems to the electrical grid, which is a problem in many parts of the state because of what the Hawaiian Electric Company describes as over-saturation issues. Civil Beat. HB1889, known as the Homeless Bill of Rights, is widely supported, but not by some of the very people whom it would supposedly protect. Hawaii Independent. Lawmakers in the state House and Senate are making another attempt at Jones Act reform. The maritime law requires shipping vessels traveling between U.S. ports be American built, owned and manned. Critics say this leads to high transportation costs for Hawaii. Tribune-Herald. A state senator Wednesday called for the University of Hawaii to investigate whether it gave Oceanic Time Warner Cable company "preferential treatment" in extending a sports television contract. Hawaii News Now. On Tap at the Hawaii Legislature: March 13. A selective list of bills, resolutions, hearings, briefings and events for Thursday at the state Capitol. Civil Beat. A developer's much-debated request to raise the height limit on a Kuhio Avenue hotel-condominium tower received a 9-0 approval from the Honolulu City Council on Wednesday, despite opposition. California-based PACREP2 LLC will now get to build its 280-unit tower at 2139 Kuhio Ave. up to 350 feet, instead of the standard 300 feet allowed within the Waikiki Special Design District, after the Council approved Resolution 14-38. Star-Advertiser. About 1,000 community members from the Aikea Movement, a job preservation effort organized by Unite Here Local 5, are expected to rally at Honolulu Hale on Thursday in support of Bill 16, which seeks to preserve hotel jobs by requiring property owners to obtain a permit if they plan to convert 20 percent or more of their hotel rooms into condominiums.Star-Advertiser. Hawaiian Electric Co. is pursuing an interim plan to bring liquefied natural gas to Oahu in shipping containers, while pressing ahead with a longer-term strategy to import bulk supplies of LNG to replace the fuel oil it burns in many of its power plants, a top HECO official said. Star-Advertiser. Several measures that critics say are thinly veiled attempts to undo West Hawaii’s scuba spearfishing ban are advancing through the state Legislature. House Concurrent Resolution 65 passed out of the Ocean Marine Resources and Hawaiian Affairs Committee on a unanimous affirmative vote. Rep. Faye Hanohano, D-Puna, chairs the committee and cosponsored the bill, which calls for a statewide, appointed task force to consider fishery rules. West Hawaii Today. You might not like what they have to say, but you have to let them say it. That’s the gist of a memo sent out last week to County Council members following an incident at the Feb. 19 council meeting where a testifier was cut off when he attempted to criticize Monsanto Corp. and Hilo Councilman Dennis Onishi for supporting genetically modified crops. West Hawaii Today. Two Big Island renovation projects received funding to proceed from the state Wednesday, when Gov. 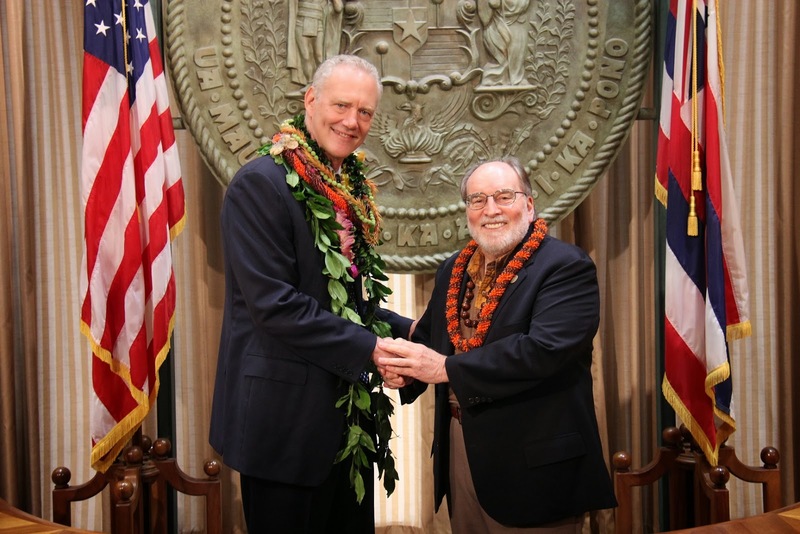 Neil Abercrombie released a total of $64.7 million for capital improvement projects across the state. Tribune-Herald. Because it failed to submit information that certified it as a nonprofit organization, the Lanai Community Health Center will not receive $866,546 in federal funds, setting back its progress of constructing a new facility for a year. Maui News. The Kula man who led the more than decadelong fight by substitute teachers to obtain back pay received his partial settlement check in the mail Tuesday. Maui News. An estimated $72.6 million of matching state and federal grants for a Kīhei-Upcountry Highway are included in the 2014 supplemental budget that was advanced by the state House of Representatives, according to information released by Representative Kaniela Ing of Maui. Maui Now. The Recycling Center at the corner of the Kahekili Highway and Makaʻala Drive in Waiehu will close on Monday, April 7, 2014, due to illegal dumping and infrequent use, county officials announced today. Maui Now. Hawaiian Airlines is accelerating the start of its new service between Los Angeles and Maui. The new start date for the flights between Los Angeles and Kahului will be May 2. The airline says the start date is moving up a month in response to strong demand. Associated Press. Debralynn DeSilva Carveiro may not have a lot of degrees on paper, but the Hanapepe resident said she makes up for it through life experiences gleaned by raising a family and running her home-based “adult novelty items” business. And that is what the mother of six children and grandmother of 12 said she brings to the table in her run for mayor in this year’s election — her second run for a county office. Garden Island. The Kauai County Council passed a measure Wednesday asking state lawmakers and the Department of Land and Natural Resources to cease all legislation seeking to regulate coastal and marine resources around Niihau. Garden Island.